From massive views to modern eateries, Colorado’s national-park-poster-child town may just surprise you. Dropping down into Estes Park on approach from Route 36 will send most drivers into a tizzy—the views are that gobsmacking. Surrounded on three sides by Rocky Mountain National Park, Estes Park is one of the most unique and easiest-to-access towns for National Park Adventures. Grab a morning cup at Kind Coffee or Inkwell & Brew—Estes’ most hipster coffee shops. Fuel up before a day of adventure at Mountain Home Cafe for classic diner fare or head to Notchtop Bakery and Cafe where the french toast sandwiches and belgian waffles pair beautifully with creative breakfast cocktails. Grab something sweet at Cinnamon’s Bakery, Donut Haus, or Estes Park Pie Shop. Enjoy tacos and margs at Ed’s Cantina and elk burgers at Penelope’s on Estes’ main street. For dinner, Bird & Jim (one of Estes’ newest restaurants) serves rustic mountain dining in an ingredient driven kitchen. Here, charcuterie trays, wild game meatloaf, and a variety of tasty starters will please even the most finicky palates. 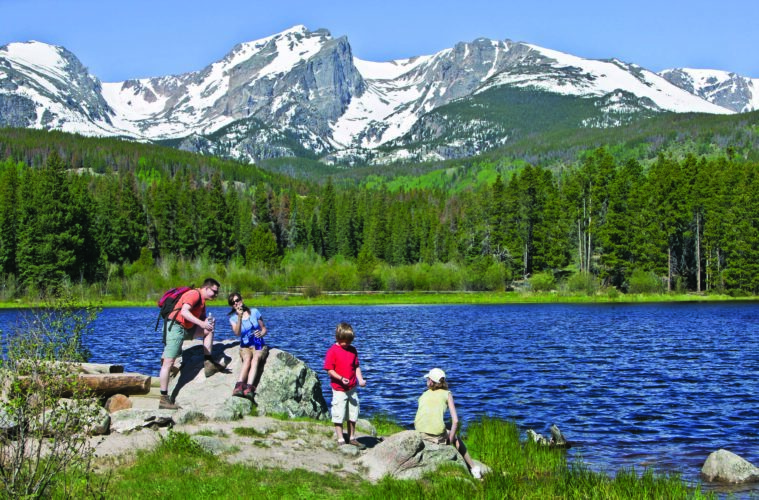 Because Estes has been ushering visitors to Rocky Mountain National Park’s door step since the early 1900’s, there are plenty of options for lodging. With its iconic old-timey feel, The Stanley Hotel is a building from the past with a welcoming attitude for modern day travelers. From their pop-up restaurant (called Table: A Culinary Journey and featuring local Colorado Chefs) to their weekly concert and event series “Stanley Live,” The Stanley has embraced the modern world with its contemporary offering. If cabin life is more your speed, check out Streamside on Fall River. With one- and two- bedroom cabins as well as studio cabins and a motel, Streamside’s diverse lodging options are perfect if you want to dine in, relax in a private hot tub or watch moose and elk along the river over morning coffee. The star of any Estes vacation is Rocky Mountain National Park. With over 350 miles of trails over 450 square miles, it has stunning drive-access vistas for beginners all the way up to backcountry adventurers for those seeking the extreme. Guided or unguided hiking, birding, biking, rock climbing, fishing, and horseback riding can all be done in this majestic park. If you are into rock climbing, check out Estes’ Performance Park. This outdoor amphitheater gets its echoing acoustics from the faceted rock wall backdrop. Once local climbers recognized its potential and the town gave it a go, the Performance Park became a stunning in-town climbing destination. Hire one of the exceptional guides at Estes Park Mountain Shop and try your hand at cracks and crags. For families, the National Park Junior Ranger Program will keep your little ones perfectly distracted by sights, sounds, and colors, allowing family adventures to last that much longer.